The easiest way to make Arduino and processing talk is via Firmata. Firmata is a program that runs on Arduino and allows you to control it from Processing. Basically, you’ll upload Firmata on your board once then you can close the Arduino app (the IDE) and then simply work from Processing. 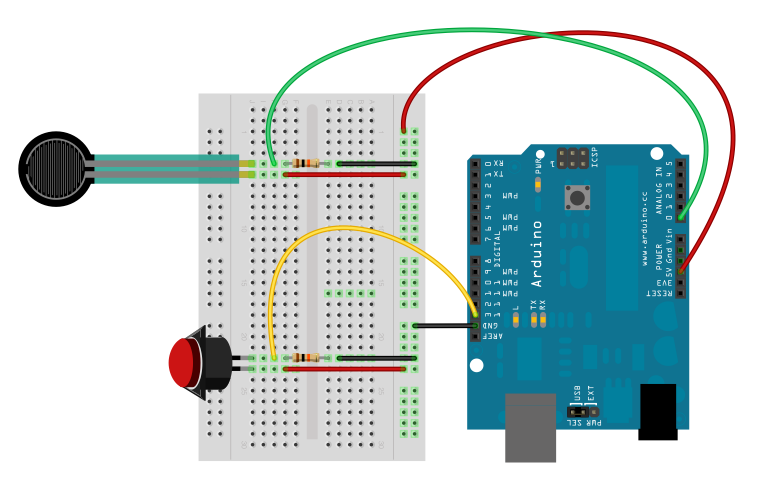 The full instructions to make arduino talk to Processing through Firmata are here. and upload it to the Arduino board. You can now close the Arduino application. Obviously the Arduino needs to be connected to the computer with Processing all the time. – Threshold switch, if the sensor reaches a certain value the background changes. – Combine this example with your order and chaos processing sketch, replacing the pressure sensor with a slider or another analog sensor. – Team up with a friend and use two knobs potentiometers to make a digital etch-a-sketch. One pot controls x, controls y, the red buttons clear the drawing.